The hundreds of thousands of ballots counted since Election Day not only helped Democrats to get over the hump and flip several U.S. House seats in California, but also propelled governor-elect Gavin Newsom to safely record the best showing in history by a Democrat in a Golden State gubernatorial race. The outgoing lieutenant governor now sits at 61.95 percent in his race against Republican businessman John Cox. Prior to Newsom’s victory, Democrats had won 17 of the 47 elections conducted for governor since statehood. The previous high water mark for the party was set last cycle when Governor Jerry Brown captured 59.97 percent against former U.S. Treasury Department official Neel Kashkari. [It should be noted that California’s top-two primary system – in place since 2012 – ensures that voters only have a binary choice at the ballot box in the general election. For most major political offices, this means third party candidate options will usually not be available]. Previous victorious Democratic nominees for the office had won with an average of 52.3 percent of the vote. The 61.9 percent recorded by Newsom is the largest percentage received by a California gubernatorial nominee since Republican Governor Earl Warren was reelected with 64.9 percent in his 1950 race against James Roosevelt. It is also the best showing by a non-incumbent gubernatorial nominee in the state since long-serving Republican San Francisco Mayor James Rolph won 72.2 percent in an open seat race during the Election of 1930. Only Rolph and Republican Lieutenant Governor Clement Young (71.2 percent in 1926) fared better than Newsom among non-incumbents in California history. 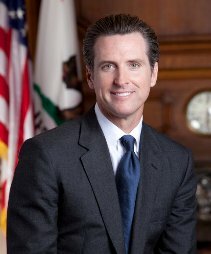 Newsom ranks fifth overall among all California gubernatorial nominees since statehood trailing Governor Warren in 1946 (91.6 percent) and 1950 (64.9 percent), Rolph in 1930 (72.2 percent), and Young in 1926 (71.2 percent). The last Californian to win at least 60 percent of the gubernatorial vote was GOP Governor George Deukmejian with 60.5 percent in his 1986 reelection rout against Los Angeles Mayor Tom Bradley. The political fortunes of Democrats have certainly changed during the last generation in California, winning five of the last seven gubernatorial elections since 1998. From 1898 through 1954, Democrats won only one of 15 contests for the office (State Democratic Chairman Culber Olson in 1938). 2 Comments on "Gavin Newsom Records Biggest Democratic Gubernatorial Win in California History"
1. It should be noted that Earl Warren was nominally the second “Democrat” to win the post in 1946 after CULBERT Levy Olson, when “cross-filing” was permitted – making the 91.6% showing at least mildly misleading! 2. Two additional notes regarding Newsom’s historic win: 1) He may well have not attained the 61.8% share (or whatever the final, official tally turns out to be), had he not gone out of his way to prevent ex-LA Mayor Antonio Villaraigosa from landing one of the two runoff spots; and 2) He apparently became (by fewer than 1000 votes) the first D general election gubernatorial aspirant to carry Orange County since “Jerry” Brown when he stood for his first re-election in 1978. 3. “…binary choice…’third party’ candidate options…” For the forseeable future, one spot for statewide elections (except for the presidential contest) is sure to be clinched by a Democrat. The other spot, it would seem, is truly up for grabs; e.g. Democrats Eleni Tsakopoulos Kounalakis and Edward Paul Hernandez for lieutenant governor; and Democrat Ricardo Lara and Independent (“no party preference”) Stephen Leo “Steve” Poizner for insurance commissioner. Indeed, the Republicans barely had a candidate for the Final Round (“binary” option) of the governor election at all arguably because Newsom, the victorious candidate, “helped” the otherwise nondescript Cox (who previously sought offices in Illinois but was a first-timer in CA electoral politics) land the “second” spot.